This past autumn I was given the wonderful opportunity to lead three separate classes exploring the practices of bodhichitta, maitri/metta, and tonglen, and how they relate to the work of social restoration. Called ‘Power, Privilege & Difference’, the format for these classes was experimental, co-developed with my dear friend, John Tsungme Guy, a Naropa graduate and someone I consider to be part of my dharma family. Together, we came up with an approach of presenting a teaching and then exploring how that teaching enables and empowers us as activists. Each class followed the same format, but the changing attendees and the different practices made them all very different. Participants came from all kinds of backgrounds, which was something John and I set the intention to make possible by offering the classes free of charge and without needing any prerequisites. The result was a wonderful mix each time, with some folks choosing to do all three and others attending only one. Each time we had multiple genders, ages, cultures, racial identities and practice levels present, which added to the richness of the three hours we spent together. The feedback we collected was overwhelmingly positive—participants enjoyed the different activities and how the container allowed for folks to be vulnerable and open. Participants also had suggestions for improvements to the format, including a call for more frequent and longer classes in the future. Smaller numbers are, probably unsurprisingly, a key aspect to folks feeling comfortable opening up. They allow for deeper discussion and for the group to deviate from the agenda without the day running overtime. This possibility of moving away from the day’s structure was crucial for the classes to accommodate the differing backgrounds and experiences of participants. Sometimes we needed to take ten or fifteen minutes to unpack a word, or we needed to have time for a longer break or an extended discussion following one of the activities. Many people were interested in scheduling a more casual, drop-in discussion group for the future, to provide a space to come together to explore the topics of the class in more detail, on a regular, ongoing basis. As the facilitator, I found the workshops deeply nourishing, but I, too, was noticing what worked, what didn’t, and what was good but could be enriched. Much of what I took away had to do with the amount and structure of the time we had, a concern that was, as stated before, shared by most of the participants. 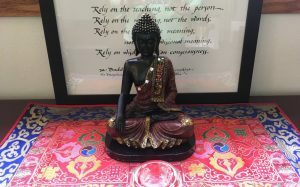 The three hour class worked quite well for exploring bodhicitta, which is something we ‘flash’—connecting into spontaneously when we encounter suffering, , but it didn’t fit as well for a multi-step practice like metta or something as challenging as tonglen. 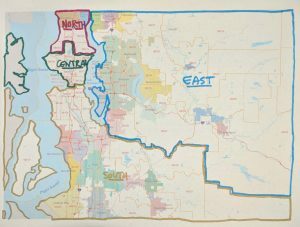 As of this writing, the Seattle Shambhala Center has similar offerings in the works for 2019, thanks to many other members of the community. 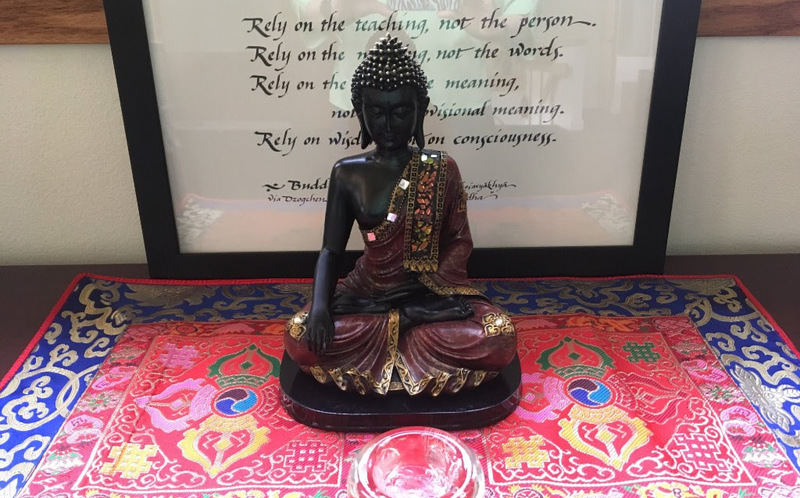 Come April, Elesa Commerse and Acharya Susan Chapman will be offering a retreat on The end of suffering: Claiming our vulnerability as strength – Restoring a vision of noble sangha as refuge. This program will be posted on our website soon. Also in the works for 2019 is a discussion group to further conversations about the concept of whiteness and how to bring our awareness to it so we can uproot it. 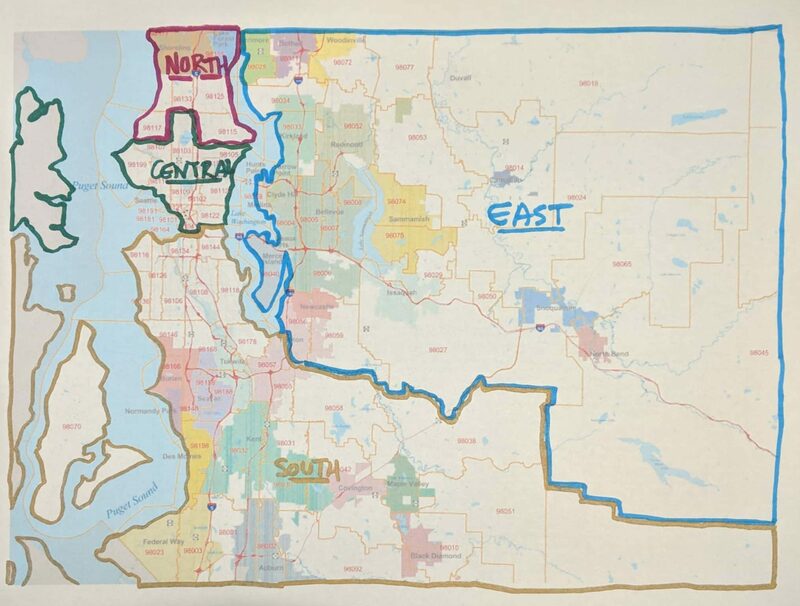 A Seattle city map marking the four deleg locations. 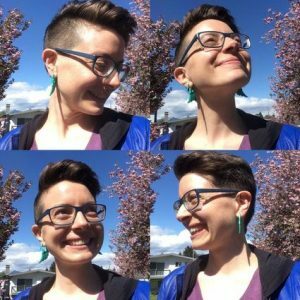 If this is the kind of engagement you are looking for and you don’t want to wait until the spring, the Seattle Shambhala Center has also been making ongoing offerings of Listening Circles and Salons. Listening Circles have taken place for the past several months. The first Salons were hosted by Sala Sweet on November 17th and December 1st, and more are planned in the coming weeks and months. The Buddha modeled what it was to challenge systems of oppression by rejecting the caste system and pointing out that it was created by humans. The teachings on basic goodness are reminders that we are worthy because we exist, regardless of our embodiments and what we are told about our value in a Capitalist-dominated culture. Part of creating enlightened society is looking at the ways our current culture obscures this—the systems of gatekeeping and cultural conditioning that prevent some folks from participating as they want to, or create imbalanced representation in leadership. Whether we attend a Salon, go to a discussion group on race, or take a workshop that explores power imbalances, the Dharma has given us an abundance of tools we can use to show up fully and do the work that needs doing. I want to thank Shambhala for giving me the opportunity to offer the classes I have, and invite folks to step up with their own offerings and requests for more teachings in this vein. As a community, we do our part through individual practice and how we come together in various ways to share where we are on the path, for the sake of all beings.